The Voracious Auspice is one of the ten Auspicious Asterisms (as-su’ud). The Arabic term indicates good fortune or something that is auspicious, especially a star. The Auspicious Asterisms are all pairs of otherwise unremarkable stars, except for one that is comprised of four stars. The Voracious Auspice is a pair of stars, of which the western one is brighter than the eastern one. The brighter one was imagined to be moments away from swallowing the dimmer star and taking its light in the process. 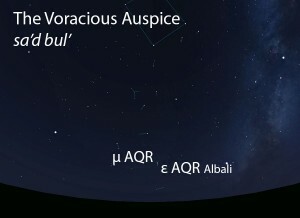 The Voracious Auspice (sa’d bul’) as it appears in the west about 45 minutes before sunrise in early August. Sky simulations made with Stellarium. A pair of stars close to each other, one of which is dimmer than the other. The Auspicious Asterisms do not figure in the calendar of the rains stars. In early listings of the lunar stations, the Voracious Auspice is the 25th station of the year. This was later changed to the 23rd lunar station after the stations were adjusted to begin with the vernal equinox. 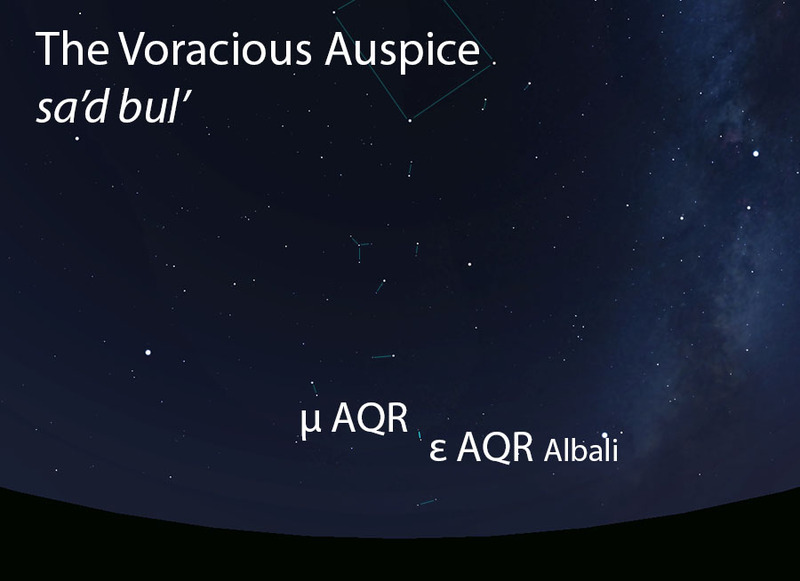 The Voracious Auspice is part of the Auspicious Asterisms (as-su’ud, السعود) folkloric celestial complex.